Mumbai’s infrastructure and governance problems can be fixed only if the city directly elects a mayor and vests him with all the necessary powers. This is thirty-sevenyear old, two-time MP from South Mumbai, Milind Deora’s solution to sorting out the mess his home city is in. None of the 269 elected representatives from the city, including corporators, MLAs and MPs, had any exclusive power or any vision for Mumbai. But with devolution of power to a mayor, there will be more accountability and pressure on that office, and will soon have it seeking authority over the police, MHADA, and other agencies. Maharashtra was the second biggest state in the country and its capital needed a new model of governance. In a one-hour interaction with the Mumbai Mirror, Deora, who is now Minister of State for IT & Communications as well as Shipping, said Mumbai’s governance is too fragmented. If he had to use his funds as an MP to build a Rs 10 lakh toilet in his constituency, it would need some 30 clearances from multiple agencies, making it an arduous exercise. The young leader found Kejriwal “definitely a character” and conceded nobody was taking BJP’s prime ministerial candidate Narendra Modi lightly. But the hype about Modi could not be bought, and elections are more than just a personality contest. His calculations are that even if the BJP did get 40 per cent of the vote, with Modi, the “entirely right face” of the BJP , which is already a right of centre party, getting coalition partners will not be easy. Should the partners compromise on their ideology in allying with the BJP, then keeping the alliances going would be a problem. As for Kejriwal, only God knew whether the attention he was getting would lead to a proportionate election outcome. Deora could not help being excited when the apolitical movement started by Anna Hazare became a political movement and led to electoral participation, but felt let down when Kejriwal quit the Delhi government, not even providing a reason. According to him, Kejriwal plays the opposition all the time is neither solution-oriented nor realistic. And some of the biggest thugs in his own constituency were joining AAP, said Deora, referring to a not-so-above-board project of one of the AAP members, which he said he had opposed with the help of well-known activists in the city. Deora, who has been in the limelight in the recent past for his criticism of the Maharashtra chief minister, insisted he has a good personal equation with him. His own reading was that the CM, to be fair to him, was finding his feet in the state after having been for years at the centre. In the Campa Cola case, when Deora wrote to Sonia Gandhi asking her to get the chief minister to do something to help the residents, he admitted he did get a bit excited. As far as South Mumbai is concerned 80 per cent of his energies during the coming polls will be directed against his principal opponents, the MNS and the Shiv Sena, the difference in 2009 being that one did not know how strong the MNS was electorally. “I have a good sense now…. 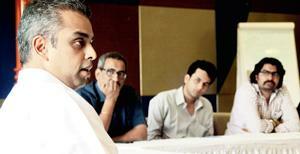 there is a little more predictability,” said Deora. The rest of the candidates, including Meera Sanyal of AAP, he dismissed as being of secondary concern. He thought of himself as accessible to his constituency, having spoken on behalf of its interests. He had been vocal about the Campa Cola issue, the cluster development for Bhendi Bazar, the Eastern freeway, a housing regulator for Maharashtra and so on. His pet theme by his admission is mobile tower radiation and he had persuaded his ministry to make the radiation limits ten times more stringent in 2012. That Congress Vice president Rahul Gandhi criticised the government’s Ordinance attempting to get around the Supreme Court’s verdict on convicted lawmakers shortly after Deora himself had tweeted his criticism was a complete coincidence, he claimed.